Rashtriya Madhyamik Shiksha Abhiyan (RMSA) has issued notification for the recruitment of 194 teachers posts. Eligible candidates may apply online through official site www.rmsagujarat.in on or before 26-08-2015. More details given below. 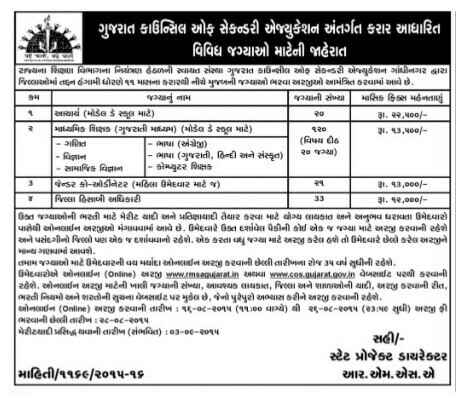 Rmsagujarat recruitment teacher ni merit list kyare mukase? rmsa ma 194 teachar requiment nu merit list kyar sudhi mukase? rmsa nu merit list kyare mukase?